Yahweh, your God, is in the midst of you, a mighty one who will save. He will rejoice over you with joy. He will calm you in his love. I know that I often say that many of the promises are my most favorite, but this is really one of my favorite Old Testament Bible passages. What a picture of God's intimate heart for His kids! He says that He lives right in the midst of us, that He is mighty to save us and that He rejoices over us with great joy and singing! This is one of those amazing images in the Bible that speaks of a Father's delight for His children. I believe that the connotation here is that God is actually not able to contain Himself with the joy that He has for us. My prayer today is that each and every one of us would be able to let this image go deeper into our hearts than it has ever gone before. God is excited over your life! He is so happy that He sings His love songs over you and me. 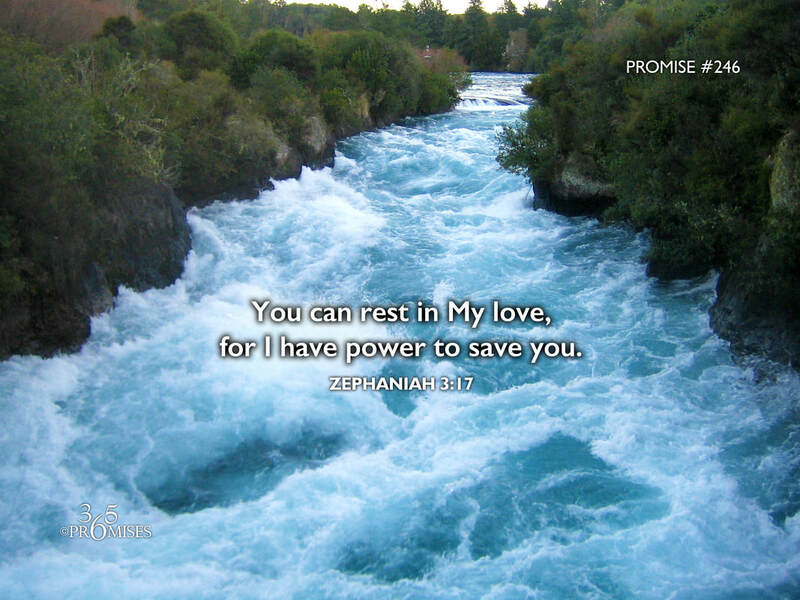 Part of the promise of this one Bible verse is that because God really does love us and He has power to save us, we can rest in His love. We don't have to be afraid any longer. He is big, He is strong and He is mighty to save us! All we have to do is yield to His love today and rest in His arms.